Mimicking the photosynthetic function of green plants and algae is one of the major technological challenges scientist around the world are facing nowadays. Natural photosynthesis transforms water (H2O) and carbon dioxide (CO2) into oxygen and carbohydrates using exclusively the energy of the sun. An artificial photosynthesis scheme will work in an analogous way, absorbing sunlight to combine water and CO2 into oxygen and chemicals, including fuels. Fuels and fine chemicals are essentially produced from fossil reservoirs, whose retrieval and use have a deleterious impact on the environment. The combustion of fossil fuels (coal, oil and gas) is causing emissions of large amounts of “greenhouse gases” (GHGs) to the atmosphere, provoking global warming and affecting climate change. 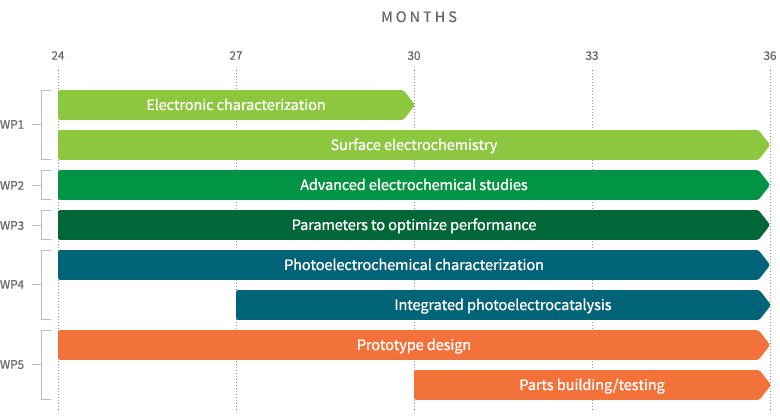 A-LEAF European consortium seeks the realization of an artificial photosynthesis platform: for the capture and transformation of solar energy into chemical energy, as sustainable substitute for fossil resources. Solar cells have reached very good efficiencies in the transformation of sun irradiation into electricity (> 20%) at reasonable prices. However, electricity, as an energy vector, presents two major issues: transport and storage. Grid and batteries are not efficient in terms of losses and energy density, jeopardizing long term autonomy and reliability. These are some of the major reasons why most industries rely on fuels. Chemicals are easy to transport, without energy loss, and far superior to batteries regarding volume, weight and large applications. Direct transformation of sunlight into valuable chemicals, though, demands a clean fast process, still to be developed. A-LEAF starts from atomic-scale studies to determine experimentally and theoretically the main parameters for optimization of the chemical transformations at surfaces to combine water and CO2 into oxygen and energy-rich chemicals. This knowledge will be transferred and up-scaled into (photo)electrochemical set-ups to maximize performance. The champion components will be combined into a single photoelectrocatalytic (PEC) device: an artificial leaf. This multidisciplinary and comprehensive project will be executed by young and renowned European researchers from 13 recognized institutions located in 8 European countries, including COVESTRO, a world-wide leading materials company. Beyond the scientific challenge, A-LEAF also commits to a low-cost approach. Solar fuels will only have societal impact if they can compete with fossil fuels in the marketplace. With this in mind, our consortium will work with competitive materials and processes, avoiding the use of precious metals, or rare/expensive raw materials. A minimum price point is our objective, as ambitious and relevant as efficiency or reliability. Our dream is to obtain economic sustainable fuels and chemicals. Fuels from sunlight, water and atmospheric CO2. Exclusively using carbon, silicon, iron, or copper. A-LEAF is working hard to make our dream come true. © 2017 - 2020 A-LEAF All Rights Reserved.